Tom Ollar and Jim Bennett have developed a very interesting prototype for a next-generation version of the Visual Studio 2010 IDE. They present 20 new concepts ranging from the inherently useful (visual stack) to the somewhat silly (remoting eye, an eyeball that indicates your programming partner is connected to the session). One interesting concept is the “mini,” shown in the photo at left. 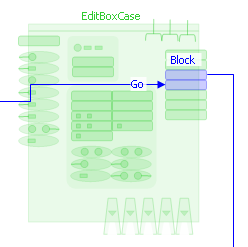 Before you say “not another diagramming standard!” note that the “mini” DebugDiagrammer is pluggable and can be replaced with UML or your own custom diagrammer. The intent is to visualize objects, not classes. The “mini” acts as a thumbnail showing the working internals of an object. I’m a sucker for next-generation user interfaces. I love watching movies like Johnny Mnemonic and Minority Report to ogle their futuristic UIs. But I believe that future interfaces will be more simple and less cluttered, similar to what we’re seeing emerge on the iPhone. The days of “command smorgasbords” — layers upon layers of menus, toolbars and panels — will eventually give way to simple, malleable interfaces that provide just the information and controls you need at any one time to perform your task. Displacement in a user interface (UI) is when you are working with data in one place, and the software forces you to go to a completely different place to add or edit the data. UI displacement results in interrupted work flow, wasted time, user confusion and frustration.